Gear 360 (2017): How do I charge the battery of my Samsung Gear 360 (SM-R210)? The new Gear 360 is equipped with a smaller, internal battery compared to its predecessor. Keep the battery fully charged because you don't want to miss capturing the perfect moment. 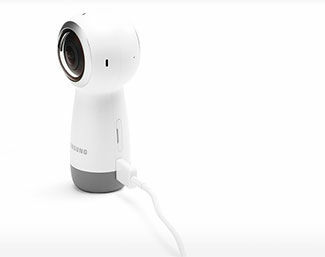 To charge the Gear 360, connect it to a charger using the provided USB cable and remove the cable when the indicator light turns green. Note: The provided information refers to camera sold in Canada. The available settings and options may differ from devices sold in other countries. Note: Keep track of your Gear 360's battery life using the Camera Status Screen or the Indicator lights. 1. Connect the larger end of the cable into a charger, and then connect the charger into an electric outlet. 2. Connect the smaller end of the cable into the multipurpose port on the Gear 360. Note: The indicator light will glow red while the Gear 360 is charging. 3. Remove the cable when the battery is fully charged. Note: The indicator light will glow green when the charging is complete.